I chomped down a good old piece of old-timey Hollywood cornpone the other day: the 1935 version of The Last Days of Pompeii. It was gloriously dopey. The 1935 was at least the fourth adaptation of the novel of the same name by Edward Bulwer-Lytton, who these days is better known for posthumously and (surely) inadvertently lending his name to an annual contest for deliberately atrocious prose. His book, written in 1834, had been made into films in Italy in 1908, 1913 and 1926; the 1935 film that I watched was not only the first English-language version but the first non-silent version. The directors, Ernest B. Schoedsack and Merian C. Cooper, were fairly fresh off their massive 1933 hit King Kong; between that film and The Last Days of Pompeii, Schoedsack directed Blind Adventure (1933), the inevitable Son of Kong (1933) and the John Barrymore comedy Long Lost Father. Cooper is noted more for his work as a producer, but I'll take this opportunity to recommend a documentary that he and Schoedsack codirected in 1925: Grass: A Nation's Battle for Life. Fascinating film. In Italy, "sword and sandals" pictures like this one have a long history. Equal parts melodrama, special-effects spectaculars and beefcake showcases, these films constitute a genre that's usually referred to as peplum, a word that supposedly derives from the Greek term for the tunics worn by so many of these films' characters. Generally — and unfairly, in my opinion — poorly regarded, these films were nevertheless wildly popular for decades, with particular spikes in their popular favor in the late 1910s and the late 1950s through the mid-1960s. 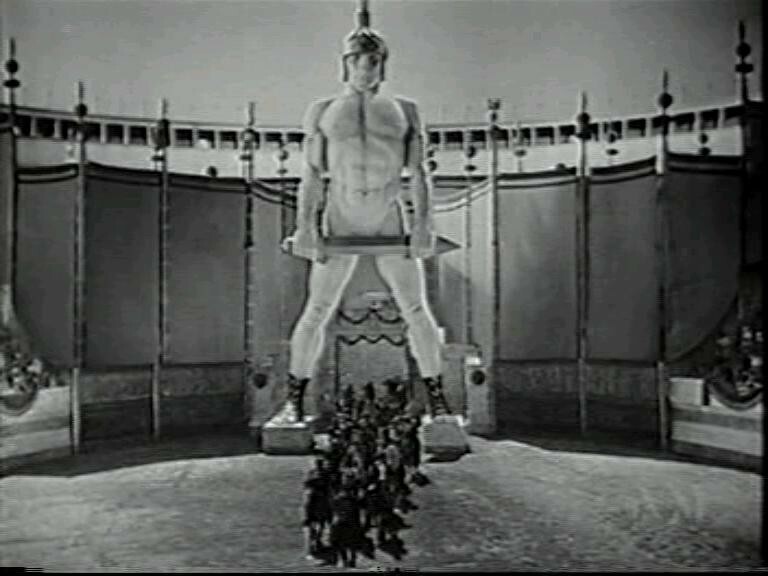 In that latter period, the most famous peplum performer was, by far, the American actor and bodybuilder Steve Reeves, who — just to bring things full circle — appeared in the 1959 version of The Last Days of Pompeii, which was codirected by none other than the maestro himself, Sergio Leone. Anyway, what the hell was I talking about? 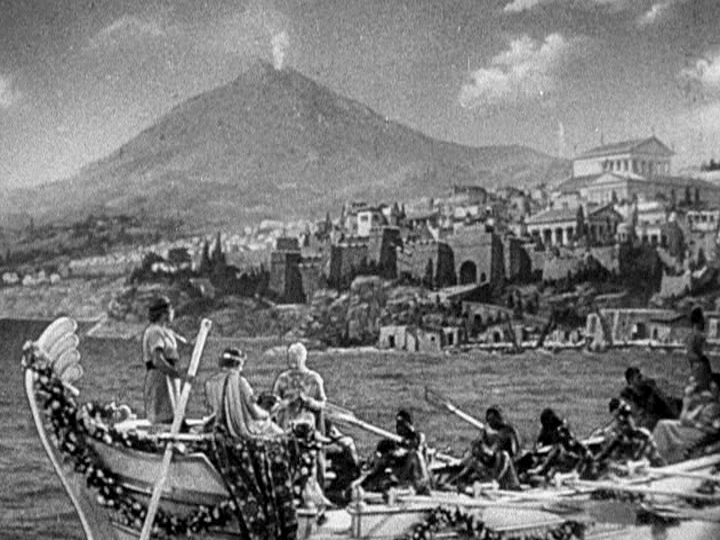 Oh, yeah, the enjoyable dopiness of the 1935 version of The Last Days of Pompeii. That dopiness, for me, arrived mostly in the form of the film's simple-minded foreshadowing. "Volcanoes are just so darling when they start smoking, aren't they?" Please note the smoking mountain in the background. That'd be Mt. Vesuvius, the volcano that buried Pompeii (and nearby Herculaneum) in AD 79. In 1935, as in the present day, most people know one fact about Pompeii: that it was destroyed by the eruption of Mt. Vesuvius. The makers of The Last Days of Pompeii knew very well that most people who paid to see the film (or, in my case, bought a used copy of the DVD for three bucks) would shell out for the express purpose of watching buildings collapse, people get buried under mountains of ash and, generally speaking, things go boom. The film delivers on that promise, but only in its last 12 or 15 minutes. Its first 80-odd minutes of running time are occupied mostly with the story of a man who rises from humble blacksmith to champion gladiator to pillar of the Pompeiian business community. 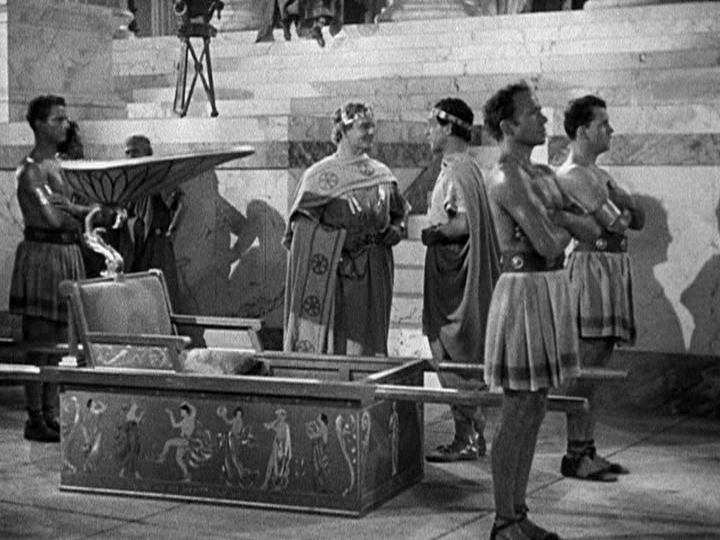 As he rises to prominence, he also loses his wife and infant son to a chariot accident (really); adopts the son of a gladiator he kills in combat; enters into an ill-advised mercantile arrangement with the scheming Pontius Pilate (played by Basil Rathbone, who runs away with the film); and, by dint of a couple of chance encounters with a "famous teacher" who happens to be passing through Southern Italy, becomes one of the earliest adherents of Jesus Christ. I have no idea how accurately the film draws on its source novel, but these kinds of melodramatic turns are, I gather, exactly the type of narrative devices for which Bulwer-Lytton is so poorly regarded. When visiting scenic Pompeii, I always travel by palanquin. 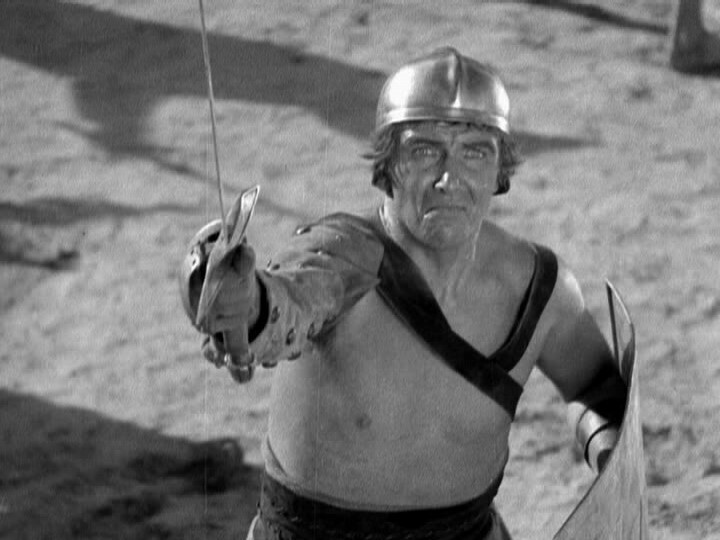 The story of Marcus the blacksmith (Preston Foster) is, frankly, not very interesting, though his occasional encounters with Jesus (who's always kept tastefully offscreen, lest the film's producers be accused of violating the "Code" dictum to portray religions with the utmost respect) were quite amusing to me. I imagine that it was pretty dull to most viewers in 1935, as well, and I'm sure that Cooper and Schoedsack realized it. Which is why, I betcha, they frequently compose their shots so that the ever-smoking peak of Mt. Vesuvius is visible in the background. Here and there, characters even comment on the propitiousness of the volcano's plume of smoke. OH, THE IRONY. Clearly, these reminders of the volcano's imminent explosion are there to placate viewers. Each shot of the mountain is a little tease that effectively says, "Bear with this sappy story a little while longer, and we'll reward you with scenes of chaos and fiery destruction." And, indeed, the filmmakers are as good as their word. 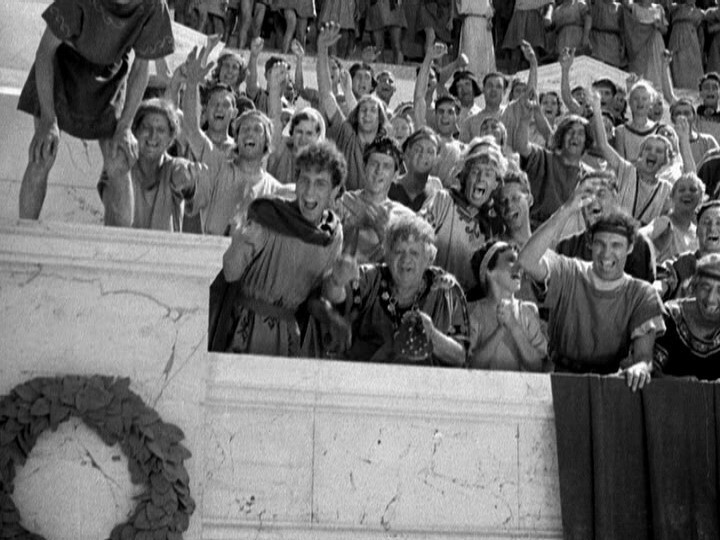 Though cheering for the actual spilling of blood, these spectators at a Pompeiian gladiator contest are generally more civilized than modern hockey fans. We all know that any film that refers to Pompeii in its title will include scenes of volcanic destruction. Yet we're unlikely to pay money to see a film that's nothing but 90 minutes of volcanic destruction, much as we think we might enjoy it. Even though the story of The Last Days of Pompeii is highly hokey, it's vitally important (even to the most bloodthirsty viewers), because it provides the delays and suspense that are necessary to make the film's fiery payoff truly satisfying. The film's frequent foreshadowing is clumsy, yes, but it's also realistic, because it reminds us that our true desires in seeing this film will indeed be realized. It's as clear an example of this kind of delayed gratification as I think I've ever seen in a film. The somewhat artless structure of The Last Days of Pompeii points to a tension that's as relevant now as it was in 1935: that between story and spectacle. In film-studies circles, the latter is often known as "The Cinema of Attractions" [PDF download], in reference to a widely known essay by film scholar Tom Gunning by the same name. In that seminal essay, Gunning notes that story and spectacle, in effect, need each other: The former provides a structure for the latter, and the latter provides punctuation for the former. It's just as true for the Transformers films as it is for The Last Days of Pompeii. Ever it shall be thus, at least in popular films like these. And that's all right by me.